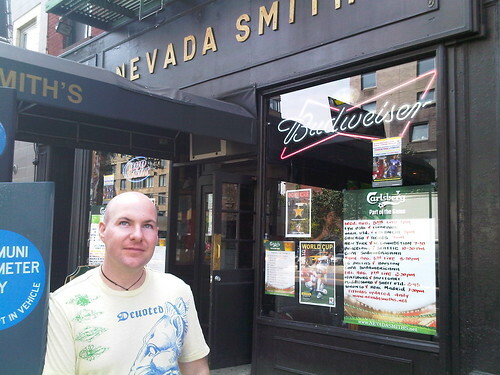 Nevada Smith's in New York's East Village is a prime spot for watching soccer in the city. My friend Kai took me there for an English Premiere League game a few years ago. It was a bright, sunny afternoon but once we stepped through the front door, we were in a completely different atmosphere. 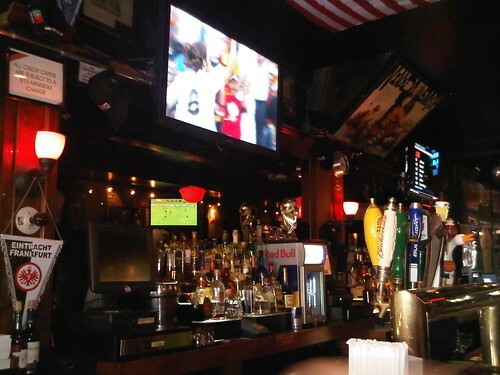 The bar was dark, illuminated by the glow of multiple, large plasma TV's hanging around the rectangular room. And it was packed with people too. Each side of the bar supported one of the teams. I can't recall who played, but it was probably Chelsea or Arsenal and Manchester United. During the match, fans for each team would sing various cheers of support. It was a great atmosphere, but I didn't appreciate soccer back then as much as I do now. On this trip to NYC, my brother lives just a few blocks from Nevada Smith's, so we stopped by for a drink after my Drew Barrymore sighting in Central Park. I ordered a frosty cider from the tap, and we caught up in an atmosphere completely the opposite of what I'd first experienced there – quiet, empty, and sunlit. The walls were adorned with signed soccer jerseys from around the world. According to their website, 100 matches are broadcast live every week! Thanks for taking the time to discuss this, I experience strongly about it and love learning a lot more on this topic. If possible, as you gain expertise, would you mind updating your blog with additional facts? It is very helpful for me. Generally I do not learn article on blogs, however I would like to say that this write-up very compelled me to check out and do it! Your writing style has been amazed me. Thanks, quite great article.